I was looking at my TPT stats yesterday and realized that the March bulletin was downloaded 2000 times, but the April bulletin has only been downloaded 1500 times. What's the deal? If you'd help me out and spread the word about the bulletins this week, that would be great. We'll see if we can get that extra 500 downloads in the next 2 days! I prayed the Divine Mercy Novena this year with the students and kids. We listened to some youtube videos, one with the prayer spoken, and one with the sung prayer. 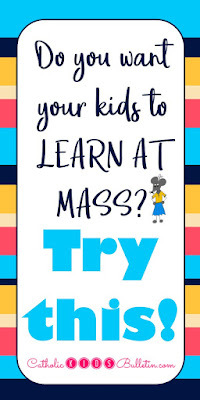 One student said, 'remember when you made us listen to that rosary video? This is worse!' So, apparently, they were not feeling the divine mercy. BUT, they willingly listened and prayed, and I'm sure their frustration helped some people in purgatory. Is that how it works? BTW--I read this book last year, and I highly recommend it. It's an easy read, but there are so many great ideas for added prayer! Has anyone seen this movie? I'm trying to decide if I should order it to add to Divine Mercy week next year. I'm still loving this Seek and You Shall Find game. I have one student who asks to play it EVERY DAY during homeroom. Granted, he's using it as a way to avoid reading a book, but I'm completely ok with that! Speaking of books, it was 'screen free week' for my kindergartner, so I wanted some fun/mindless book to read at the end of the day. I found this series by Ally Condle, and then I was oblivious to the rest of the world all day Saturday while I read the first book in it's entirety. Yay for good books! Boo for obsessiveness on my part.... I decided to get the audio books for the next books in the series so I can hear the story and still function and get things done. Did I freak out enough yet about the R.J. Palacio books? I finished the Julian Chapter earlier this month and I loved it just as much as I enjoyed Wonder. Seriously, I can't recommend them enough. It's the month of Mary! This Rosary book would be a great project throughout the month of May. 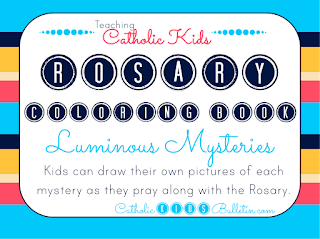 Kids can add more drawings throughout the month and create their own Rosary picture book.